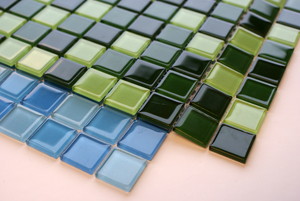 Hakatai Select series glass mosaics have a modern look and brilliant range of colors. Select tile is an economical alternative to thicker glass tile, while affording the same high quality. All tile have a glossy finish. Blends are mesh-mounted for easy installation. Tile is approximately 1/8" thick.